If you desire a healthy and vibrant lawn, talk to a professional lawn care company about their lawn aeration service. Aerating your lawn is the foundation for a thriving outdoor living area. Aeration helps your lawn to breathe. Air flow is crucial for your turf to rejuvenate from dry periods and foot traffic. Basically, lawn aeration is the process of removing plugs of grass and soil so that air, nutrients, and water can slowly penetrate the ground and reach the roots of your turf grass. Lawn aeration prevents the soil from being compacted. Compaction causes the roots of your grass to suffocate, which prevents proper nutrients from reaching them. Lawn aeration services can strengthen the roots of your turf, improve the effectiveness of your lawn fertilization, and increase your lawn’s ability to absorb heat which are essential components for growth. Some soil types require the aeration process more often than others. For example, clay soil which is typically very compact needs the aeration to loosen soil and promote air flow so grass will grow. There are optimal times for the lawn care professional to aerate your lawn, depending on what type of grass you have. Bermuda grass, which is a warm season grass (and very common in Alabama), would typically be aerated towards the end of spring. This is just before its peak growing season. Cool season grass, like ryegrass or Kentucky bluegrass, is usually aerated in early spring or the fall. Many people try to aerate their own lawns. 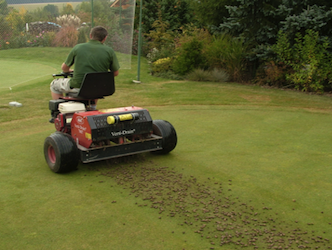 However, the core aerator machine that is usually rented is heavy and difficult to use without experience. Therefore, it is usually worth the investment to find a reputable lawn care service with experience in turf management to perform the task. Not only will you not have to worry with renting and transporting the bulky machine, but they will be able to complete the job in much less time. You will see a lush and thicker lawn in just a few weeks after aeration. The result is well worth the effort. Once the plugs are removed from the ground, they are left on top of the grass. While it may look like a big mess, it is actually good to let them break down naturally and give all those nutrients back to the soil from which they were pulled. It typically takes a week or two for them to break down, but the effects of aeration will last many months. Mighty Green Lawn Care is a leading provider of lawn aeration services in Birmingham, Alabama. Whether you know you need an aeration service or you aren’t sure, give us a call or fill out our contact form to discuss how we can help your lawn thrive.